Decorate with cushions gives life to a room and allows us to revamp it without making big investments. That is true. But easy? If you can find in shops more than 1,000 different models, how can you choose those four or five that will look great on your sofa or bed? There are no magic formulas. Unfortunately, the style can not be explained. But in this post we want to give you a basic guide to decorate with cushions and some easy stylist tricks. Then, you can mix and match colors, sizes and prints according to your taste and the style of your house. It is certainly the funniest part and also the most complicated. Mix and try until you find the winning combo. In our blog we also have lots of photos as inspiration to help you. Cushions with Blasco & Blasco fabrics. Size. In decoration, size always matters. In the case of cushions, their size is conditioned by the sofa size. 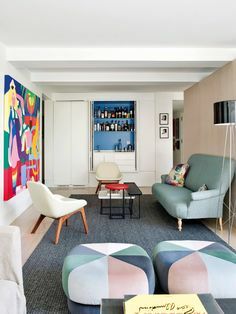 A conventional sofa works with standard cushions, which are usually 40 x 40 or 45 x 45 cm. Balance. The biggest cushions, more than 60 cm, are comfortable, inviting and trendy, but should be reserved for large sofas. Low-back or small size sofas fit with small cushions. Shapes. There are 4 basic shapes of cushions: square, rectangular, round and bolsters. Apart from its appearance, the shape also fulfills a function. Squares are perfect to support the entire back. Rectangulars support the lower back or neck. Bolsters do not slide and can do better their function in a leather sofa pec6edn. Combinations. 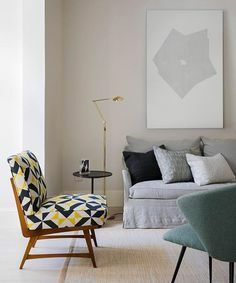 When decorating with cushions many people choose different colors even different patterns, but choose all them in the standard size (40cm) and square. Doing that, we miss a lot of the fun. Success also involves combining sizes and shapes, because this adds depth and makes all works better. Various sizes. Visually it works better if the larger cushions are at the ends and the smaller cushions at the center. And it’s also more practical because you will not have to remove the big ones every time you sit down. Matching cushions. Sometimes the sofa is sold with some cushions in the same fabric of the upholstery. It never works because the cushions are camouflaged on the sofa and do not contribute anything. Change them for others that add color or texture. Inserts. Beauty is inside? Yes. Even the best cushion will not look nice if is amorphous and flattened. Thinking about cushion inserts does not seem exciting, but choosing them well is a part of the success. There are feather fillings and synthetic fibers. Feathers and down. Feathers and goose down are the most expensive option, but it is well worth investing money if the cushions are going to be used and will not be merely decorative objects. You will be grateful when you want to take a nap on the sofa. In the long term, inserts with feathers, down or mix of both will come out profitable, since they are more durable than synthetic fibers, don´t lose their shape and can be reused for years just changing the covers. Fibers. If you do not want to invest much and the cushions are merely decorative, or they are of very little use, you can choose fibers inserts. For outdoor cushions, you must always use fiber inserts, because feather inserts are not recommended. Give them shape. If you like very compact cushions, use an insert a little larger than the cushion cover. And be sure to put the insert well, without leaving empty corners. Number. There are many theories about whether even or odd numbers work best, but the main rule is that if you have to move cushions to sit comfortably on the sofa, it’s because you have too many. 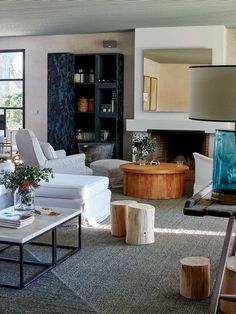 Groups of sofas and armchairs. If you want to decorate with cushions a sofa (or two) and some chairs, you have to consider all them as a group. 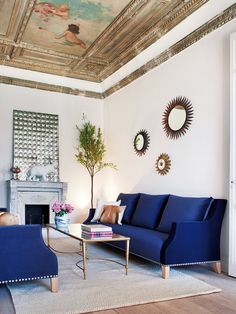 It doesn´t mean you have to repeat cushions or coordinate prints, but everything should work as a harmonious set, taking into account the color palette of the room, the fabrics used and the general style. Decoration style. When decorating with cushions you have to respect the style of the room. This influences the choice of fabrics, colors, textures and placement of the cushions. Classic style. In these ambiences work well velvet, silk or linen, and trimmings. 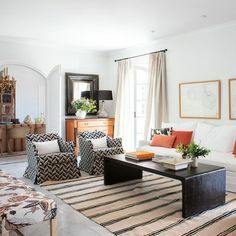 This style accepts combinations of colors, patterns and textures, with cushions usually grouped symmetrically. Contemporary design. This style is associated with fewer colors and few prints, or none, and better geometric. 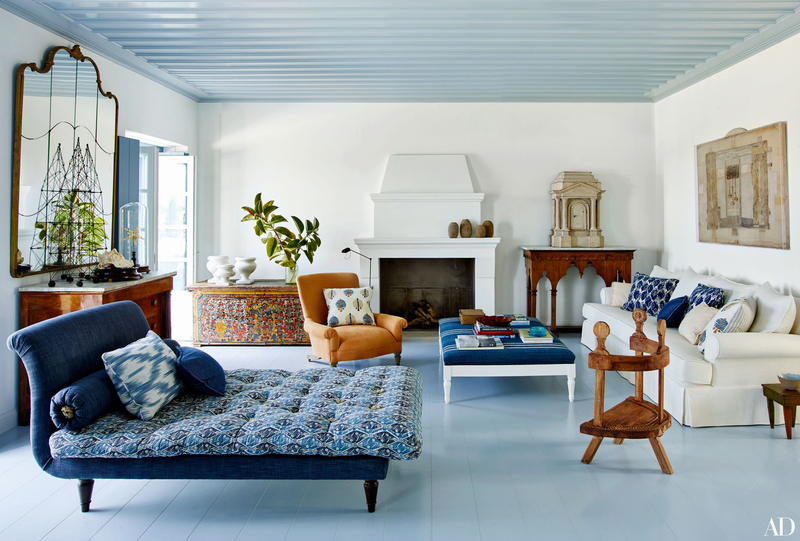 Decorate with cushions in lightweight fabrics like cotton or linen, in large sizes, and not grouped. 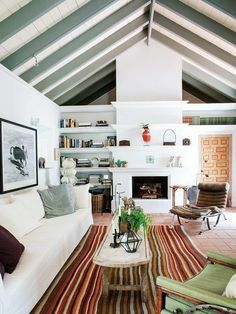 Eclectic style. The most difficult option but also the ones that will give you the greatest satisfaction. Try complicated combinations of prints and fabric. To avoid the chaos, give it coherence unifying with color. Summer and winter. Decorate with cushions allow to change between seasons. It is a small luxury to have velvet cushions in winter and fresh linen cushions in summer, just changing the covers. Looking for more inspiration? Check this posts: How to style a white sofa and Tips to combine cushions. To wash linen is easy because it is a natural fiber. Just think that for centuries linen was washed in streams, boiled in cauldrons and dried in the sun. Fortunately, today we have washing machines and more comfortable ways to hand wash. As for dry cleaning, it is only necessary when the linen has special treatments or is mixed with other fibers. In any case, always follow the care instructions supplied by the manufacturer. These instructions, whether for washing linen at home or for dry-cleaning, are elaborated taking into account many variables, such as preshrinking treatments, threads, dyes used, possible anti-wrinkle or anti-stains treatments, etc. Linen can be dry-cleaned, laundered in washing machine or by hand, or steam cleaned (a practical way of cleaning curtains, for example). Freshly washed linen smells wonderful and gives you a greater sense of well-being. Follow these tips to wash linen at home and you will see how the more it is washed, the softer and more luminous and beautiful it becomes. – Linen always shrinks the first time you wash it and then do not do it again. There are two options: to wash it before using it, or to buy a pre-washed linen (as we will see later). – Linen should always be removed slightly damp. Remove it before it is completely dry. And never use the dryer. The reason is that the natural moisture content of linen varies between 6 – 8%. When it dries too much, the fiber becomes brittle. If this happens, linen fabric will take several hours to absorb moisture from the air and recover its full flexibility. Vía: Blasco & Blasco y Anouk De Gruyter. – In addition to the dryer, bleach is the other big enemy of linen fabric. No matter if it is a white linen, this product weakens the fiber and yellows it. – To wash linen, either by hand or machine, use pure soap or a mild detergent. And be sure to put a sufficient amount of water, since the linen is very absorbent. – Clean any stain when recent. – The water temperature can oscillate between hot and very hot depending on the care instructions. – Rinse with plenty of water to remove all detergent and residual dirt. This avoids the formation of “age spots”. – Don’t wring to drain after washing linen. – The best way to keep the white linen is to dry it in the sun. – Ironing linen fabric is not a cumbersome chore if you do it when linen is a bit damp. After you have removed wrinkles with the iron, leave linen drying. – One trick of our grandmothers to keep the moisture was to put the linen towels rolled up in the fridge for a few hours. Then towels were taken out one by one and ironed. If you have space in your refrigerator, try doing it with curtains or covers inside a plastic bag. It will make ironing much easier. It is also a way to avoid moisture odor when you can not iron the linen after washing it. – Steam ironing dry linen will be much less effective than ironing it wet. Steam from a domestic iron is usually not enough. – Iron first the reverse side, then the right side. This will bring out all the natural shine of the linen fabric. But if it is a dark color, iron only by the reverse side. – Pure linen withstands very high ironing temperatures. In any case, always follow the manufacturer’s instructions and, if you do not have them, test in a corner or with a scrap of the fabric. Pre-washed linen has been repeatedly washed at high temperatures and with special products to prevent it from shrinking later, enhancing its softness and giving it a special “patina”. As linen improves its qualities with washing and becomes incredibly soft after three years, choosing a pre-wash linen means speeding up this process and saving a lot of washes. Stonewashed linen means that it has been washed in large machines with pumice or volcanic stones that bash and tumble the fabric’s fiber. Stonewashed linens becomes more supple and have patina, in addition to amazing shades of color. Of course, this treatment don´t affect the quality and durability of linen fabric, but always rely on specialized manufacturers to avoid any surprise. Do you want to know more about linen fabric? Check this post about decorating with linen fabric.